Portland, Nov. 7—To the Editor of The Journal—The various equal suffrage organizations, through their representatives in the state central campaign committee, wish to extend their very cordial appreciation to the many editors throughout the state who have so materially assisted in the recent campaign by their generous support of the equal suffrage amendment. Oregon State Equal Suffrage Association. 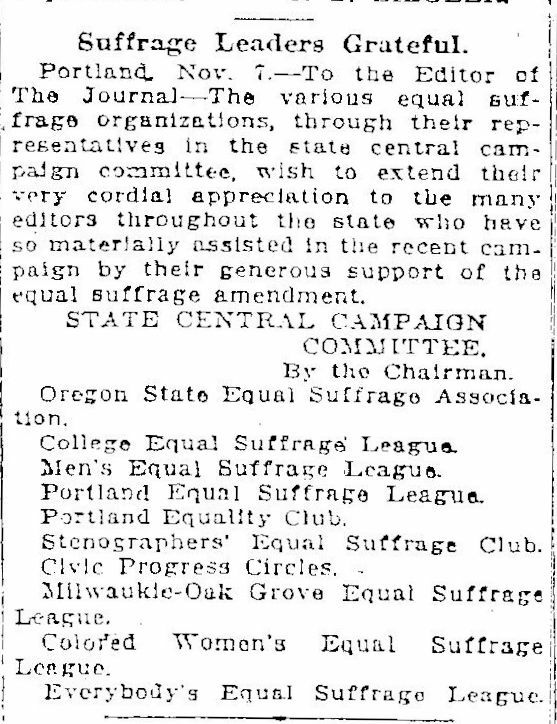 Milwaukie-Oak Grove Equal Suffrage League. Colored Women’s Equal Suffrage League.